So recently Born Pretty Store sent me some glequins for review! It's actually my first time receiving them so I really didn't know what to expect :O Glequins are basically loose sequin like glitters that are used for nail art. I may post a tutorial for those who are interested, just leave a comment below & I'll get right to it! This was my first attempt so it's a little messy :( It's incredibly fun to do though, and so shiny <3 I decided to do glequin nail gaps & an accent nail because hey glequins. The base color is from Essence's Grumpy from the Snow White collection, it's a gorgeous royal blue jelly that applies smoothly. >_< It's currently my favorite blue! 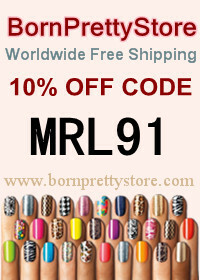 Anyway Born Pretty Store was sweet enough to include a discount coupon, which can be found in my sidebar or below for 10% off. They have free international shipping & their items are incredibly cheap :D I spend my hours in school perusing their selection of items & wishing I could have more. Products were provided for review. Please see disclosure policy for more information. This looks so pretty! I have always wanted to do a design with glequins! of your post's to be exactly what I'm looking for. Dοes one offer guest writeгs to wrіte content for you? I wouldn't mind composing a post or elaborating on many of the subjects you write regarding here. Again, awesome website!